« Wednesday Watercolour at DVSA – Week Four! Wednesday Watercolour at DVSA – Week Five! 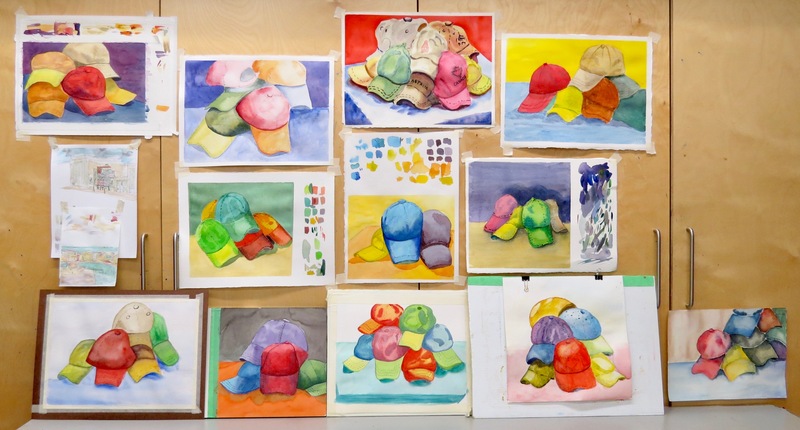 This pile of old ball caps was our painting subject at the Dundas Valley School of Art last Wednesday evening. We’ve already painted ceramic and metal objects as well as fruit and vegetables. Why not these soft, crumpled forms that take the light so nicely? Several of the students had upgraded their watercolour paper to something more absorbent and of a better quality and I’m glad they did. I reviewed soft edge techniques again and stressed simplification. It’s not necessary to paint every single wrinkle! Last week, many of the students struggled. One reason was the usual and quite normal adjustment to new techniques. The other reason was trying to overcome the hurdle of cheap paper. What do I really think about the importance of using an appropriate paper? I promise not to mention it again. There was a happy atmosphere during our critique at the end of the evening. Gaining competence with these techniques will continue to require lots of practice but the work looked great! This entry was posted on 09/11/2018 at 3:04 pm and is filed under Barry's Demonstrations, Dundas Valley School of Art, Studio Classes. You can follow any responses to this entry through the RSS 2.0 feed. You can leave a response, or trackback from your own site.